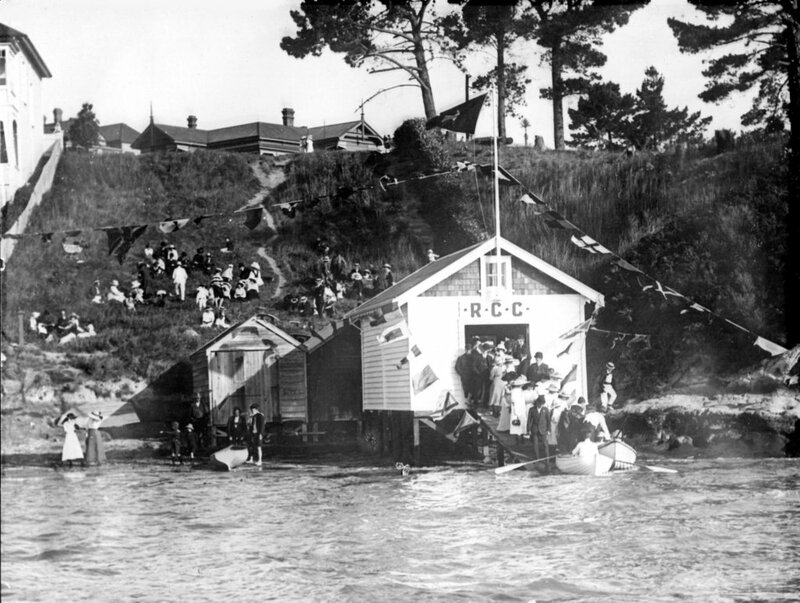 The old Richmond Cruising Club clubhouse on Sloanes Beach, Marine Parade, turned 100 this year. We celebrated on Saturday 9 November with the inaugural “Centreboard Cup” race, accompanied by fun activities on the beach. We wanted to “update” this photo of the clubhouse’s opening 100 years ago. You can view pictures of the day on our facebook page. The guest boats have started to arrive, the bunting is up, and we’re ready to go. Looking forward to the Coffee Man and our guests arriving at 10am. Race start 1100 hrs, Saturday, 9th of November, Sloane’s Beach. Race briefing ashore 10am. Race entries can be made on the day; there is no entry fee except for Mullet boats, who should enter through the Ponsonby Cruising Club. Start line shall be between the Ponsonby Cruising Club (PCC) patrol boat “Watchman”* (or a substitute patrol boat) and a yellow conical buoy off Sloane’s Beach in a West/East direction. All Other Centreboarders: Start, Watchman Island (port), to finish (start/finish line between yellow conical buoy off Sloane’s beach and the Ponsonby Cruising Club patrol boat). * Yes, it is confusing having a boat and an island with the same name in the same race! You can view the Centreboard Cup poster. The race will be followed by a prize giving and music. If the weather is too bad, we may postpone till Sunday. Please check this page for any postponement details.